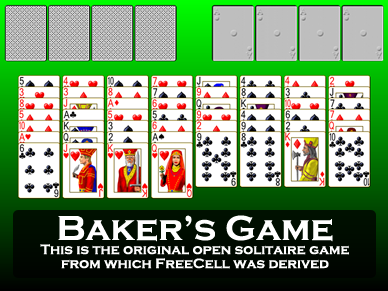 Screen shot of the game ForeCell from Pretty Good Solitaire. 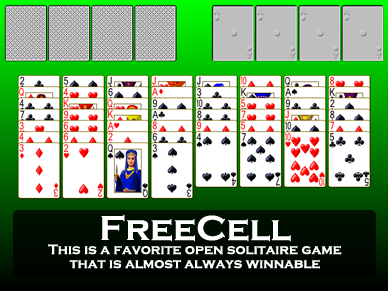 ForeCell is a very close varation of the popular game FreeCell. 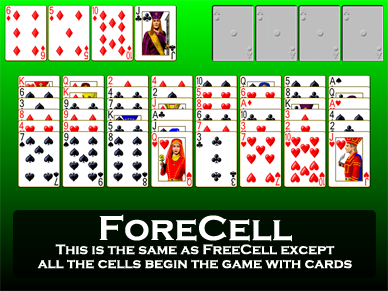 ForeCell begins exactly like FreeCell except the game starts with all of the cells filled by cards. 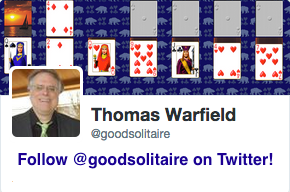 This will make the game somewhat harder than FreeCell. The 52 cards are dealt into 8 tableau piles of 6 cards each. All the cards are face up, which makes ForeCell an open game. Open solitaire games are usually the most interesting and give the most opportunity for skillful play and ForeCell is no exception. The object of ForeCell is to build 4 foundation piles up in suit from Aces to Kings. In addition to the foundations and tableau, there are 4 cells. Each cell is a storage place for one card. Any available card can be moved to an empty cell, and cards in the cells can be moved either back to the tableau or to the foundations. The game begins with cards in all 4 cells. In the tableau, building in the tableau down by alternate color. Groups of cards in the tableau can only be moved if there are a sufficient number of empty cells available to store the cards individually. If you have 2 cells empty, for example, it would be possible to move a group of 3 cards in sequence down by alternate color as a group. Note that at the start of the game, since all of the cells are filled, it is not possible to move groups of cards. You must open up some cells first. The object of the game is to build the 4 foundation piles up in suit from Ace to King. The game is won when all of the cards are moved to the foundations. ForeCell first appeared in a 1945 Swedish book. It was called Napoleon in St. Helena. 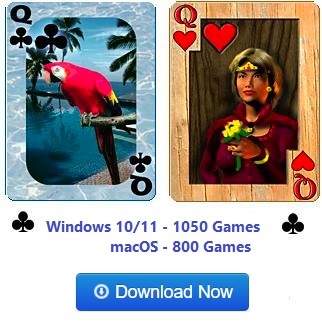 Since this is a very common name for a solitaire game, I changed the name to ForeCell to emphasize it's relationship to FreeCell when it was added to Pretty Good Solitaire.